The relationship between Charles James and Halston was long and complicated. In 1958 Page Zwecker, fashion editor of the Chicago Daily News introduced the two designers. Charles was at the peak of his fame but his world was about to fall apart, Halston who was just starting out and instantly became Charles James’s acolyte and later that year moved to New York so he could make hats for Lilly Dache. who he had met through James. As Dache recalled: “Halston learned a great deal from Charles about designing and the world of style and probably other things -too”. Charles James was grand and under his mentor’s influence, Halston became even grander. 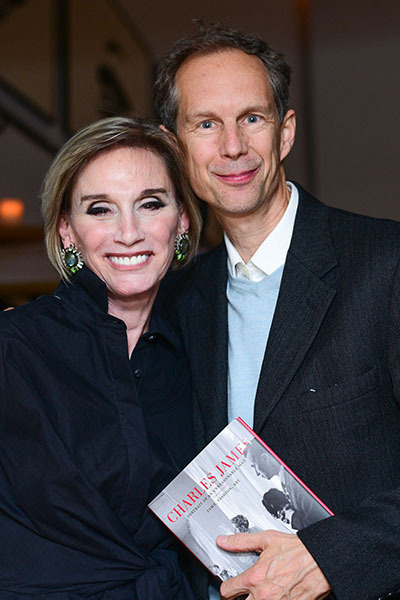 Among those turning out for the book party were Harold Koda who wrote the book’s forward, as well as James Andrew, Paula Antonelli , Susan Lowrey, Steven M.L. Aronson, Evelyn Lorentzen Bell, Charles Miers, Carlos Campos, Alva Chinn, Cece Cord, Consuelo Costin, Christina Davis, Elizabeth de Cuevas, Christy Ferer, Joanna Fisher, Michael Gross, Anthony Haden-Guest, Jones Harris, R. Couri Hay, Sharon Hoge, Elbrun Kimmelman, Margo Langenberg, Francine LeFrak, Iris Love, Tomas Maier, Charles Miers, Fern Mallis, Jane Trapnell Marino, Christopher Mason, Anton Perich, Mr. and Mrs. Peter Price, Ben Rodriguez-Cubeñas, Ralph Rucci, Charlie Scheips, Barbara Tober, Christopher Walling and Homer Layne Charles’s last assistant. Many remembered their own experiences in the house years before. All marveled at the Paul Rudolph’s famous staircases and the fireplace into which Elas Peretti famously, (in a fit of pique) flung the fur coat Halston gave her. The house was decorated with white orchids that were a Halston trademark—, another of the habits he assumed from Charles James.